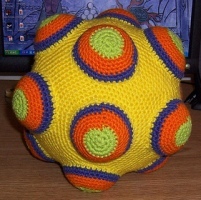 A crochet version of the magnetic ball from the Katamari game, which rolls around collecting metal objects, for some reason I don't fully understand. a ver como me sale. Muchas gracias. umm, my friend and I were making a blog, and we noticed that yours had a "cutesify" sign on it. You wouldn't happen to run that blog, would you? Cuz if you did, could you tell us how to set a picture as a background? Thanks! P.S. Sorry if you aren't the person who runs cutesify! 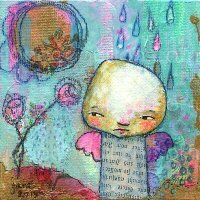 wow, there's a lot of patterns on here, love your blog, looks very good! Anonymous... it would be good if you left a name & email, so that I could reply to your question! I usually use a 3mm hook or smaller when crocheting amigurumi in 8ply wool.